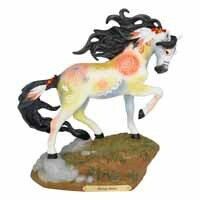 Native Paint | Painted Ponies Everyday Figurines | One Price Low Flat Shipping! From the Trail of Painted Ponies Winter 2019 Collection, Native Paint Collectible Horse Figurine. Designed be acclaimed equine artist, Laurie Cook. Made of stone resin. Measures 9.5" tall. Comes in collectible box with story card. Native Americans told stories through pictures and symbols with natural pigments. These picture writings recorded important events of a tribe. While today the meaning is not always know, it is respected for belonging to those-who-came-before.